Since my first attempt to capture sunrise “through the hole” a few year back, a couple of things have happened. Firstly, I’ve managed to get a lot more familiar with my gear – its quirks and challenges, as well as what to do to get it to really perform. 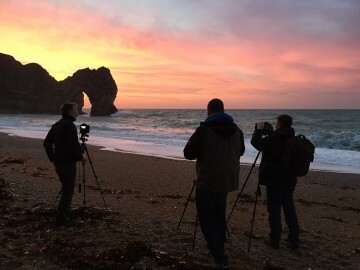 Secondly, I’ve seen a mini-explosion of photographers shrouding their images in fake mystery regarding “the art of capturing sunrise through the hole” at Durdle Door. If you seriously listened to some of these guys, you could easily convince yourself that a government clearance was required in order to get to the beach involved, along with a degree in witchcraft to control the sun’s orientation especially for your photograph. 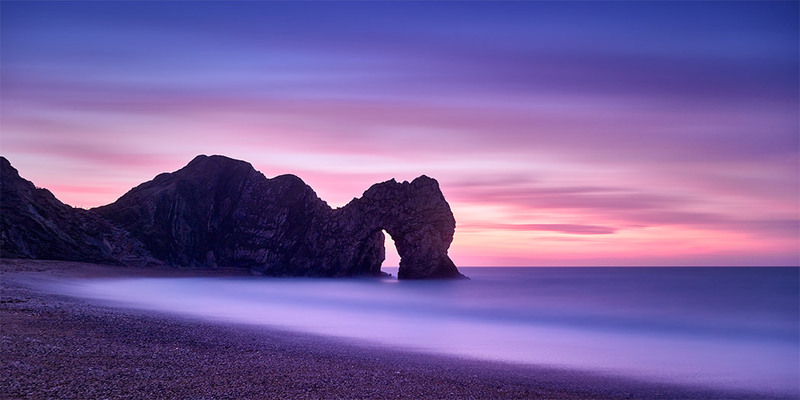 So, here to dispel the myths – as well as present my latest image, “Through the Keyhole”, here’s my guide to shooting the Jurassic Coastline’s world-famous “Durdle Door” in the winter. Making their way to meet me for this shoot were two good friends, Martyn and Mark – both of which have travelled with me to California before to shoot around the West Coast of the USA. For me, Durdle Door is a 40 minute drive away, but for these guys it was a 2 hour and 4 hour one-way trip. In fairness, it was this fact that made sure I got up in time to meet them, as the weather forecast (and storm outside my house!) suggested this would be a wasted journey if they weren’t already on their way. Fog, rain, clouds and high wind had all been forecast the night before but there was a glimmer of hope: While the forecast for Lulworth (where Durdle Door is situated) was poor, the forecast to the east in Poole was for partly cloudy skies for the morning – and this was the direction of the sun appearing through Durdle Door itself. So, 1.5 hours before, we met at the top of the road. Yes, there is a “sweet spot” of time where the sun rises far enough south to be in a great place, from a compositional point of view. In reality, however, you can see the sunrise through the hole for several weeks during the winter. While the composition may not be the same as my shot above (you’ll be to the right of it, with the gap getting smaller), there’s around 2 weeks either side of the winter solstice (December 21st) where this scene can be captured. Listening to some, you’d think it was a mad-dash for the 10 minutes on the one day of the year where this is possible, but it really, really, is a lot more relaxed than that. All you have to do is get lucky with the sky during that period of time – but use Apps like “TPE” to check the timing on where the sun will rise and when. Second, the “Durdle Door is closed over the winter” rumour. What a fantastic lie, and one that has put many people (including some I know personally) off trying to see this stunning view. 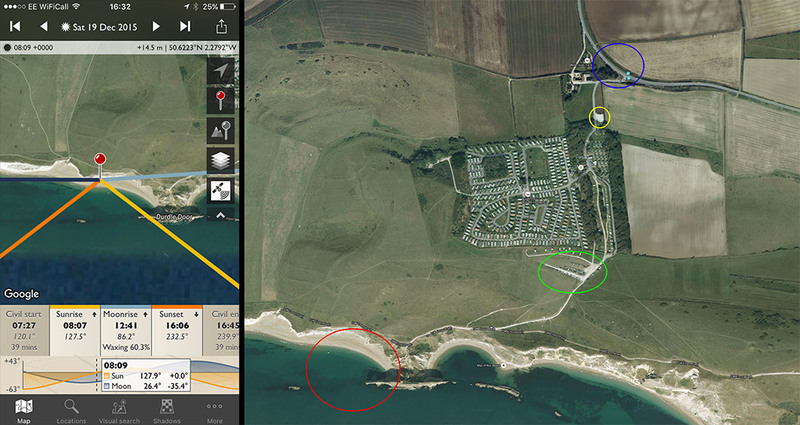 To be clear, Durdle Door Holiday Park is used by tourists throughout the summer to access the coastal path which leads to the rocks below (the red circle, above). There is a handy pay and display car park (the green circle) at the end of the holiday park which allows visitors to get nearer to the path, saving around 5 minutes of walking from the road. While it is true that the holiday park itself is closed from 1st November until the start of March each year, the access-ways and paths are most definitely not. For those new to the area, you can easily park in a lay-by on the road (circled in blue) and walk through the (empty) park to get to the coastal path – or for those who know the area a little better there are a few other options. 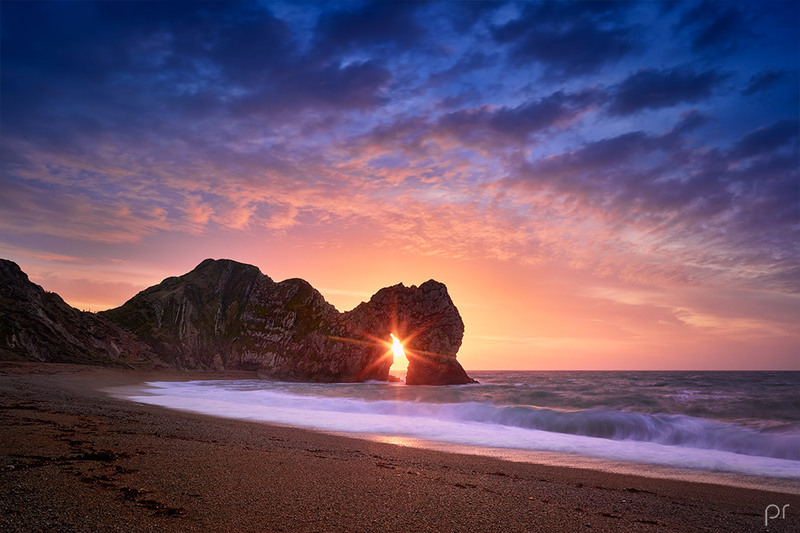 Either way, it is very much the case that Durdle Door is open year round! One small thing to note, just for the record, do not be tempted to park in the holiday park’s coach area (yellow circle) – you’re on private property, and can/will be towed if you leave your car there – you have been warned! So, with those little “fun facts” now put right, on to shooting the sunrise…! With very little sleep for all involved, the trip down the hill with a southerly gale blowing in our faces was a bit of a wake-up call. In fairness, the sky had cleared up considerably on the way to Purbeck and it was even possible to see stars in the night. For this shot to be “right” (in my view), I wanted cloud – not too much, but enough to grab the colour from the rising sun. My previous attempt at this scene had been too bland for my liking – and many other images of the same setting have disappointed me visually as, other than the sun flare, there was nothing else “interesting” about the landscape view itself. Potentially, this was looking good. Now, not being one to rely on “luck” alone, I am becoming increasingly reliant on Mark’s unique ability to force the weather to do exactly what we want whenever shooting – and this morning was no exception. Arriving at the beach, we were treated to an array of colour behind the arch as the sun got nearer to the horizon. Just having a play with my DB, I opted for a 4 minute exposure just to see how smooth we could make the scene appear. Such fantastic colours, and the wind had relented a little too. This could be the perfect setting, if only two things would now resolve themselves: 1) if the sea could stop spraying saltwater all over my filters every 5 seconds, and 2) if that pesky cloud layer sat right on the horizon could maybe disappear? The sunrise shuffle? Well, it’s simple, really. You can’t ever be in the perfect spot for the sunrise itself. Apps are great, but inevitably the sun will rise a degree or two to the left or right of where you had originally expected. Coupled with that, things like that layer of cloud sat right on the horizon – meaning the sun would only make an appearance when it was lifted about 2 degrees off the horizon – means that you’ll invariably be scrambling for the right spot when it finally happens. Along with two other photographers in the same spot on the beach, the shuffle began – click, click, beep, look left, side-step. Click, click, beep, look left, side-step. A cross between a school playground game of army soldiers and a drunken party conga, all five of us slowly made our way in a line up and along the beach with every click. At one point, I decided I wanted a closer frame – which inevitably meant that all of us in the entire line needed to move forward together – but boy am I glad I did. My final thought, however, is similar to that of when I captured Mesa Arch last month : Just don’t forget to enjoy the moment too – it’s not all about the click!